After Netanyahu won re-election in Israel, Obama didn’t congratulate him for almost a week. Apparently, Iranian diplomats don’t like hot dogs– Obama’s “diplomacy” strategy against the genocidal/terrorist regime of Iran is officially a complete failure. Not only is Iran ramping up its nuclear program and proxy attacks against Israel, but now Iran is threatening to conduct kidnapping attacks on American diplomats and religious leaders. Obama’s pseudo-intellectual elitist opinion that “talking” to Iran’s radical leaders would solve this U.S./Israel national security threat deserves an “F” grade. Obama won re-election with 69% of the American Jewish vote, despite the very long list of Obama’s anti-Israel policies and actions during his first term. After hundreds of rocket attacks from Hamas, Hillary Clinton has now announced that Israel has a “lack of generosity” and a “lack of empathy” for Palestinians. Israel, which drops Arabic leaflets warning civilians to get out of the heavily-populated civilian areas where Palestinian terrorists purposefully place their rocket launch pads before attacking– Israel, which voluntarily withdrew from Gaza in 2005 without any concessions from the Palestinians and received nothing except rocket attacks in return– Israel, which offered Palestinians 91% of the West Bank, all of the Gaza Strip, and half of Jerusalem while Arafat was in power despite the fact that Israel legitimately acquired the territory in a defensive war– is not “generous” or “empathetic”? 1 week after Obama got re-elected, Israel was attacked by hundreds of rockets from Gaza. There is a report that at least one rocket was fired from Egypt into Israel– Egypt, which Obama helped turn from a relatively pro-U.S. regime that supported Israel’s efforts to defeat Palestinian terrorists into a Muslim Brotherhood radical Islamist regime that now attacks Israel in an act of war. The Egyptian President Mohammed Morsi has even visited Gaza to condemn Israel for defending its borders from these terrorists’ rocket attacks. We have learned that Iran now “has finished installing nearly 3,000 nuclear-fuel production machines at its underground military facility near the holy city of Qom, providing Tehran the capability to double its production of medium-enriched uranium in the coming months.” So this is the result of Obama’s “diplomacy” and “tough” economic sanctions on Iran: IRAN CONTINUES TO GET CLOSER TO ACQUIRING NUCLEAR WEAPONS. And, how predictable: Palestinian terrorists are currently firing Iranian-made missiles into Israel. If Iran acquires nuclear weapons: you can bet that terrorists around the world will acquire them too. 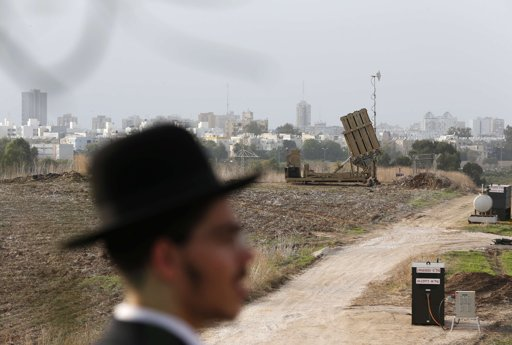 The only thing between total destruction and the Jewish people– an ancient, long-persecuted religion and culture (which has been the object of repeated attempts at genocide)– is modern military technology: the “Iron Dome,” a device that intercepts the terrorists’ missiles in mid-air.